◆ On June 27, 1972, diplomatic relations were formally established between the Governments of Guyana and China, making Guyana the first English-speaking Caribbean country to establish diplomatic relations with the People’s Republic of China. ◆ The two countries continue to enjoy smooth, friendly relations founded on historical and cultural ties which are maintained through frequent high-level exchanges at the bilateral and multilateral levels, in the areas of politics, security, culture, health, trade and finance etc. 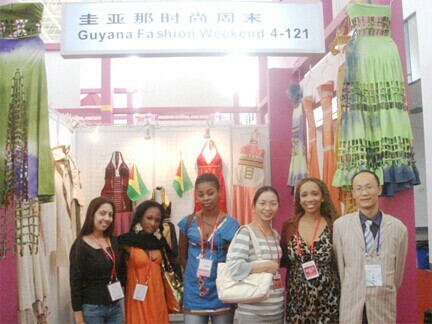 ◆ Prior to the formal establishment of diplomatic relations, Guyana supported and campaigned in favour of the restoration rights of the People’s Republic of China in the United Nations and later concluded an Agreement for the mutual establishment of Commercial Offices with the Government of China. ◆ The Government of China established a Commercial Office in Georgetown in March 1972 and an Embassy on June 27, 1972, while the Government of Guyana established its Embassy in Beijing during October of the following year. ◆ The programme of cooperation which currently exists between Guyana and China is founded on a number of agreements in the political, military, economic and cultural fields. 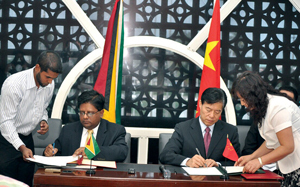 Guyana and China have concluded an Agreement on Economic and Technical Cooperation and established a Joint Commission under which leaders of the respective economic departments, maintain close interaction. ◆ The two countries have also established a Joint Committee of Trade Development and a Joint Business Council in an effort to drive bilateral trade and investments. ■ Chinese began arriving in Guyana since 1853, as indentured labourers and have contributed greatly towards the development of the society and culture. ■ At the governmental level, the two countries enjoy close interaction through programmes and initiatives under the Cultural Cooperation Agreement which was concluded in 1984. This Agreement paved the way for a number of successful cooperation initiatives in the areas of Sports, Education, Broadcasting and Press and Television, among others. ■ Over the years, there has also been rapid development in exchanges of journalists, art/performing troupes, sports officials, scholars as well as art exhibitions and scholarships. 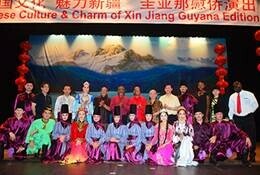 ◆ On May 19, 2014, a Confucius Institute co-founded by the University of Guyana and Dalian University of Foreign Languages, was officially inaugurated at the University of Guyana. t As per Executive Order issued by His Excellency President David Granger in January 2017, 12th January has been designated Chinese Arrival Day. ■ The Guyana Defence Force and People’s Liberation Army (PLA) of the People’s Republic of China also enjoy an active programme of cooperation in the area of military training and exchanges. ■ Visit of Guyanese Prime Minister L.S.F. Burnham to the People’s Republic of China. 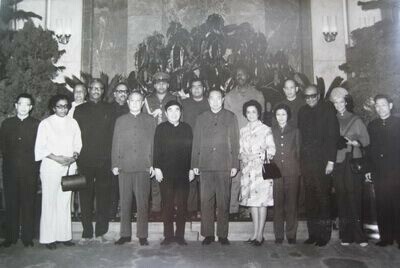 The first visit ever made by a Guyanese Prime Minister to China, during which he met with Premier Zhou Enlai and concluded an Agreement on Economic and Technical Cooperation. ■ Visit of H.E. President Arthur Chung – Guyana’s first President, to the People’s Republic of China. During the visit, he met with former President Hua Guofeng and Vice-Premier Li Xiannian. ■ Visit of Chinese Vice Premier Geng Biao to Guyana, during July 20-24, 1978 at the invitation of Hon. Prime Minister L.S.F. Burnham. ■ Vice-Chairman of the Standing Committee of the NPC, Ngapoi Ngawang Jigme visited Guyana during February 20-26, 1981 as Head of a NPC delegation. Guyanese President Burnham, First Vice-President and Prime Minister Reid, and Speaker of the National Assembly Sase Naraine met with the delegation respectively. ■ On June 11-15, 1984, L.S.F Burnham paid a visit to China in his capacity as President of the Cooperative Republic of Guyana. During the visit, he met with former President Li Xiannian, General Secretary Hu Yaobang, Chairman Deng Xiaoping and Acting Premier Wan Li. A total of five Agreements were concluded during the visit in the area of economic cooperation, culture, science and technology etc. On October 13, 1984, Chinese Vice-Foreign Minister Han Xu paid a working visit to Guyana and held discussions with then Foreign Minister Rashleigh Jackson on economic and political issues. ■ Visit to China of Hon. Sase Naraine, Speaker of the National Assembly of Guyana, where he met with Chinese President Yang Shangkun and Chairman of the NPC Standing Committee, Mr. Wan Li. ■ During February 18-21, 1990, Chinese Vice-Foreign Minister Liu Huaqiu paid a Working Visit to Guyana and met with H.E. President H. Desmond Hoyte and Prime Minister Hamilton Green, among others. ■ During April 10-15, 1990, Guyanese Foreign Minister Rashleigh Jackson visited China and met with Chinese President Yang Shangkun, Premier Li Peng and then Foreign Minister Qian Qichen. During that visit, a Protocol on the establishment of a consultation mechanism between the Ministries of Foreign Affairs of Guyana and China, was signed. ■ From June 30 to July 5, 1993, Vice Chairman of NPC Standing Committee Chen Muhua headed a NPC delegation to Guyana for an official visit. Guyanese President Cheddi Jagan, Prime Minister Samuel Hinds and Speaker of the National Assembly Derek Jagan met the delegation respectively. ■ On December 12-18, 1993, Guyanese President Dr. Cheddi Jagan visited China and met with Chinese President Jiang Zemin and Premier Li Peng. ■ From 29th February to 3rd March, 1996, Sun Zhenyu, Vice-Minister of MOFTEC attended the China/Caribbean Economic and Trade Symposium in Georgetown as Head of the Chinese delegation. ■ From April 28 to May 3, 1996, Guyanese Foreign Minister Clement Rohee visited China as Head of a governmental trade and economic delegation. Hon. 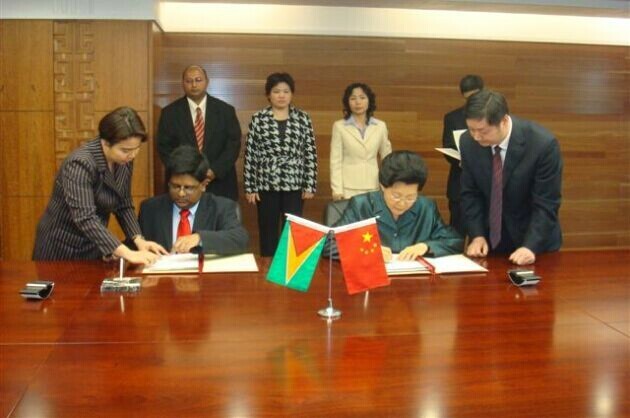 Minister Rohee attended the 6th Session of the Guyana/China Joint Commission on Economic and Trade Cooperation. ■ During July 21-31, 1996, Guyanese Prime Minister Samuel Hinds visited China as Head of a delegation of the Guyana/China Friendship Association. ■ During July 20-21, 1998, Chinese Vice-Premier Qian Qichen visited Guyana and met with Guyanese President Cheddi Jagan, Prime Minister Samuel Hinds, Speaker of the National Assembly Hon. Derek Jagan and Leader of the Opposition H. Desmond Hoyte. During the visit, an Agreement on the mutual exemption of visas for official tours was signed. Affairs of Guyana, H.E. Marilyn Miles visited China to formally launch the political consultation mechanism between Foreign Ministry Officials of the two countries. ■ Vice Minister Liu Shanzai of MOFTEC paid a visit to Guyana during March 15-17, 1999, and co-hosted, with then Foreign Minister Clement Rohee, the 7th Session of the Guyana-China Joint Commission on Trade and Economic Cooperation. ■ During July 1-3, 2001, Assistant Foreign Minister Zhou Wenzhong visited Guyana to attend the 2nd Round of Foreign Ministry Consultations. 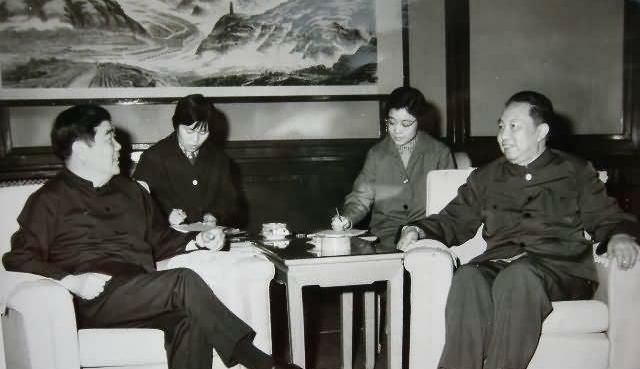 ■ From August 29 to September 8, 2001, at the invitation of the International Liaison Department of CPC Central Committee, General Secretary of the Guyanese People's Progress Party Mr. Donald Ramotar visited China and met with member of the Political Bureau of CPC Central Committee, Li Tieying. A return visit to Guyana was paid in October 2002 at the invitation of then PPP General Secretary Donald Ramotar. ■ During January 7-8, 2003, State Councilor Wu Yi led a Chinese Government Delegation to Guyana and met with former President Bharrat Jagdeo and former Prime Minister Samuel Hinds. During the visit, an Agreement on economic and technical cooperation was signed. The two sides also exchanged Notes concerning the dispatch of sports coaches. ■ From March 26 to April 2, 2003, at the invitation of President Hu Jintao, then President Bharrat Jagdeo paid a State Visit to China. During the visit, he met with Chairman Wu Bangguo of the NPC Standing Committee and Premier Wen Jiabao and signed an Agreement on the protection of investments and an Agreement on economic and technical cooperation. A friendship cooperation agreement was also signed between the cities of Georgetown and Fujian, capital of Fuzhou Province. ■ His Excellency Li Zhaoxing, then Minister of Foreign Affairs of the People’s Republic of China paid an Official Visit to Guyana during the period October 2-4, 2004. 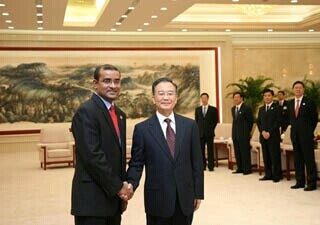 ■ The Honourable Prime Minister Mr. Samuel Hinds paid a Working Visit to China during July 20-27, 2005. ■ Her Excellency Madame Gu Xiulian, then Vice-Chairperson of the Standing Committee of the National People’s Congress of the People’s Republic of China paid an Official Visit to Guyana during July 9-11, 2007 at the invitation of the Honourable Speaker of the National Assembly, Mr. Hari Narayen Ramkarran, S.C., M.P. ■ H.E. President Bharrat Jagdeo travelled to China during September 26, 2008 to October 5, 2008 to participate in the World Economic Forum Meeting in Tianjin (September 26-28, 2009). ■ Mayor Wang Hongju of the Chongqing Municipal People’s Government visited Guyana during August 21-22, 2009 to explore new ways of strengthening bilateral cooperation between Guyana and China. ■ In July 2010, H.E. President Bharrat Jagdeo visited Shanghai as Head of the CARICOM delegation attending the CARICOM National Day ceremony at the 58th World Exposition (Shanghai Expo) in that city. ■ Assistant Minister of Commerce, Mr. Li Rongcan attended the 11th Session of the Guyana-China Joint Commission Meeting in Georgetown during March 2011, and signed a number of agreements aimed at boosting priority projects in the areas of transportation, health care, training and culture. 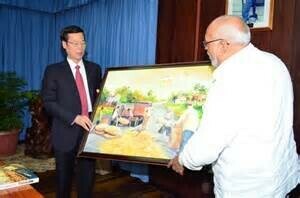 Secretary of the Communist Party of China (CPC) Tianjin Municipal Committee, Mr. Zhang Gaoli visited Guyana during June 2012 and met with H.E. President Donald Ramotar and other Government Officials. 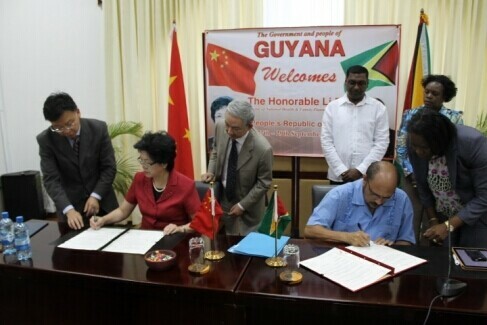 ■ Minister of National Health & Family Planning Commission, Dr. Li Bin visited Guyana during September 27-29, 2014 and concluded a Memorandum of Understanding on strengthening Guyana-China cooperation in the area of health. The two sides also engaged in discussions on the establishment of a Chinese medical faculty at the University of Guyana. ■ Hon. Carolyn Rodrigues-Birkett, Minister of Foreign Affairs of Guyana visited Beijing during January 6-10, 2015, to attend the First Ministerial Meeting of the CELAC-China Forum (8th - 9th January). During the visit, she met with Premier Li Keqiang and Foreign Minister Wang Yi.